In this book with your little eye, take a look and play I spy - so starts the classic story from best-selling author/illustrator team, Janet and Allan Ahlberg. 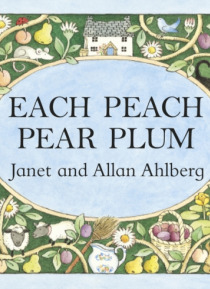 Each Peach Pear Plum introduces favourite fairy tale characters, such as Tom Thumb and The Three Bears and, with a poem on each page hinting as to what is hiding in the picture, children are encouraged to participate and follow the story th… emselves. Now available in digital format, this well-known favourite truly is a modern classic.